Next on my saga of finding the best replacement for Microsoft Money – well, OK, the best for me – is Moneyspire. Actually, I half-heartedly tried this out some 8 months ago, but I wasn’t feeling the urge at the time and I stopped. At that time they produced a free version for a single account (if I recall correctly) but that’s now been dropped: you can get a two-week trial version with limited accounts and transactions, or pony up some cash for the Basic or the Plus version. I Paypaled $75 for the Plus version; in for a penny, in for a pound. Straightaway, none of the font problems I encountered with Moneydance showed here. The UI was pretty good, although I must admit to finding the icons on the left-side nav bar a little too, er, enthusiastic for my liking. For once, I’m not that concerned about showing the summary page for the app, because (a) half the accounts there were cancelled a decade or more ago, and (b) the totals shown are completely and utterly way out of whack. Laughable, even: no, I do not owe Wells Fargo $1.2M at all. I’ll explain. What I did, after I’d played around with the app using the demo database they provide and feeling fairly satisfied, was to import all of the data from my Microsoft Money database. 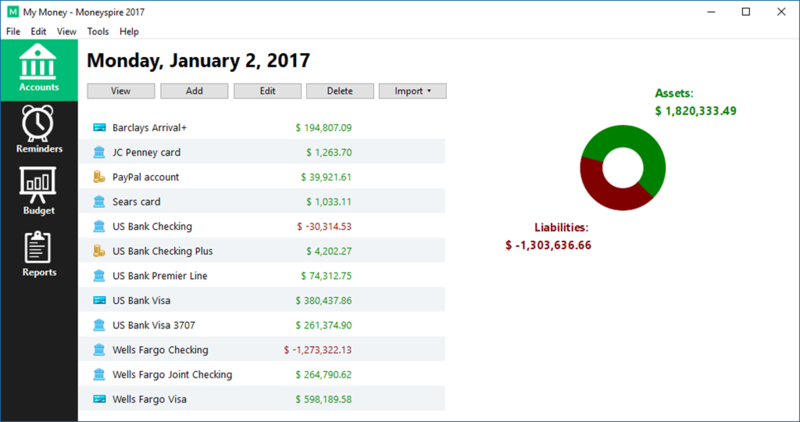 So I exported each active account into a QIF file (with Money, you export each account one-by-one, and all transactions from the start of time are included) and then imported them into Moneyspire. (They do recommend that you pre-create all the accounts in Moneyspire to begin with and then import the QIF files into each new, empty account – I strongly concur with that recommendation.) And that’s the result I got. I hasten to add that on a few of these accounts, I have transactions that go back to 1995, so 22 years ago, almost. Since these totals bear no relation to the actual amounts in each of my accounts, what the heck is going on? The issue is that every single transfer of money between the accounts over those 20-odd years are counted twice. So when I transfer cash to pay off a credit card? There are two equal entries in each account. I also transfer cash between checking accounts: two equal entries in each account. These days, I basically just use credit cards to buy things, so my bank account ends up with lots and lots of doubled outlays as I pay off the credit cards (hence the whacked-out owing of $1.2M). Since I never use any account in isolation, every single one is affected by this. In essence, because each transfer is present in two exported QIF files (the one for the ‘from’ account and the one for the ‘to’ account) and because Moneyspire makes no effort whatsoever to eliminate/merge two transfer transactions for the same amount on the same day, I’m left with the current ridiculous, nay laughable, situation. A few solutions present themselves here. One, go through the accounts as set up and slowly delete all those duped transfers, one by one. Let’s assume on average 10 years for each credit card account, times 12 pay-offs per year, times 7 cards, makes getting on for 1000 transfers to identify and delete. The PayPal account would in fact be way worse, an absolute nightmare to fix: every purchase through PayPal involves a transfer from another account to cover the purchase cost. So, all in all, let’s be reasonable and say around 2,500 fixes. By the way, I glossed over a nasty issue with these transfers: one is the ‘valid’ one and the other the ‘ghost’ one – in the image above the ghost one does not have a check number (ah, the days when I wrote a check to pay off a credit card debt every month! ), so I have to work out which is the ghost one before I delete it. Two: the techy programmer answer. Read through the QIF files, identify the spurious transfer transactions and delete them before I import the QIF files into another fresh new Moneyspire database. Or write a quick program to do so. Then possibly patch up the odd issue that remains. Three: just give up on Moneyspire. The chart on the summary page is only scaled and drawn once, when the page is rendered. If you resize the window, the chart does not re-render. I have yet to work out how to specify which database Moneyspire wants to open when run. It doesn’t default to the last one I was working on (which is what I’d expect). For me it’s inevitably the wrong one, every time. UPDATE: it turns out that it does open the last used database, I must have hit an issue with my testing when I had to kill the app (see below). Mind you, Moneyspire certainly likes to put the database somewhere deep in your AppData folder by default. No, not your Documents folder, but C:\Users\<username>\AppData\Roaming\com.moneyspire.2017\data. No, that’s not automatically backed up in my daily backup. UPDATE: of course you can put the database where you like, you don’t have to use the suggested folder. If you edit a transaction in the grid, the edit row overlays the subsequent transactions (like Moneydance does). The alternative is to show a separate dialog to edit the transaction. Adding a transaction brings up the edit row from the bottom, overlaying the last two/three rows. The in-grid transaction edit row has a Cancel button, however pressing Esc has no effect. Yes, that’s a facepalm if there ever was one. Best one yet: if you are not on the last page when you click Add to add a new transaction, the grid scrolls to the bottom to display the edit row form, but the form is not displayed properly. The edit fields and buttons do not get shown. There is no way to cancel it since Esc does not work. You have to exit the program, but even then the program is not fully terminated: you have to use Task Manager to kill it. Specifying a payee in the Report tool is a pain in the neck: there is no search. (Ditto, defining a category.) Much better is the Find option on the menu: the resulting dialog shows transactions per payee much better/simpler than the report. You can save a report, but it’s not obvious how. I was expecting a button, because that’s how you load a saved report, but it’s File | Save Report instead. If you are showing a report, the only way to load another report to replace it, is to clear the current report because it’s hiding the button to load a saved report (yep, I kid you not). In other words, it’s crying out for a toolbar or a ribbon.